I have a copy of a letter written from Poznanski to Gleizes in February 1923, just as Painting and its laws was being serialised in La Vie des lettres et des arts. He is writing from Rome and apparently intends to stay there for some time. He says he has already lost two months searching for a place where he can live and paint, and he refers to attempts to sell his own house, presumably in Paris. It seems that the Gleizeses were trying to help him in this since he asks if Mme Gleizes's 'Americans' have changed their mind. But to return to his comments on his painting. The 'three planes' he refers to are, I assume, the vertical-horizontal plane that corresponds to Gleizes's 'translation', together with the plane inclined to the right and the plane inclined to the left. Poznanski complains that Gleizes had initially taught a very systematic arrangement of these planes which he had understood and found useful. 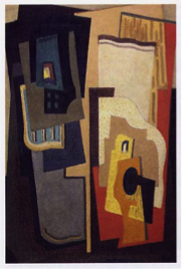 But now Gleizes was proposing a much freer, more arbitrary application of the principle. It will be seen that the corners of the planes turned to the right and to the left touch the very edges of the picture surface. Each of the three principle planes have smaller planes within them but they converge towards a common centre. 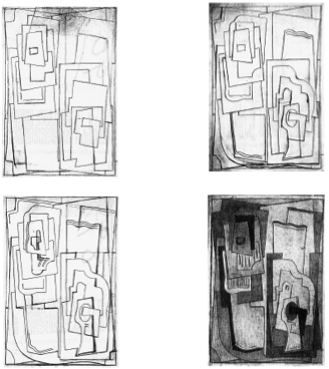 We can see the same principle applied in a series of drawings by Mainie Jellett. 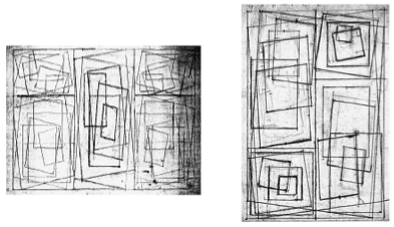 And here is a very similar drawing from the papers of another of Gleizes's pupils, the American Blanche Lazell, who studied with him in 1924, together with a drawing that emerges out of it that might serve as a basis for a painting. And a similar example from Robert Pouyaud, who also joined Gleizes in 1924. 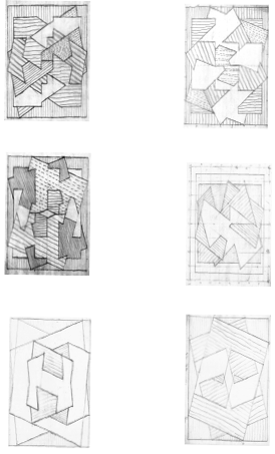 Now, going back to Mainie Jellett, here are some examples of a more arbitrary arrangement of the planes. There is still a vertical, still a turning to the right, still a turning to the left, and we might note that all the planes turned to the right are parallel to each other, as are all the panes turned to the left but they are disposed arbitrarily about the surface of the canvas. Note that by this time several different compositions, or 'elements', are combined within a single picture frame. Here is an example of the process by which this is turned into a complex pictorial organism. And this is the final painting, still by Mainie Jellett, that results - a painting with two elements from 1926.